Imagine using a photo, instead of a word, to start a Google search. You can now use a photo to harness the power of Google's search tool directly from your iPhone. Google Lens for iOS is a Google product that turns objects within a photo, or your camera, into a search. Instead of typing, just send a photo and ask Google to tell you what it is. Google can recognize physical objects, locations, text, and faces. Simply aim your camera, and Google will not only tell you are holding a spaghetti squash but also how to turn it into your dinner with recipes, nutrition information and kitchen tips. Aim your camera at a concert poster, and Google will offer to add the date to your calendar, and where to purchase tickets. Google Lens can also identify the names of plants, and tell you if that is Poison Ivy growing in your yard. Here's a photo of a poster. Google Lens provides a bio of the band members, more photos and a discology. 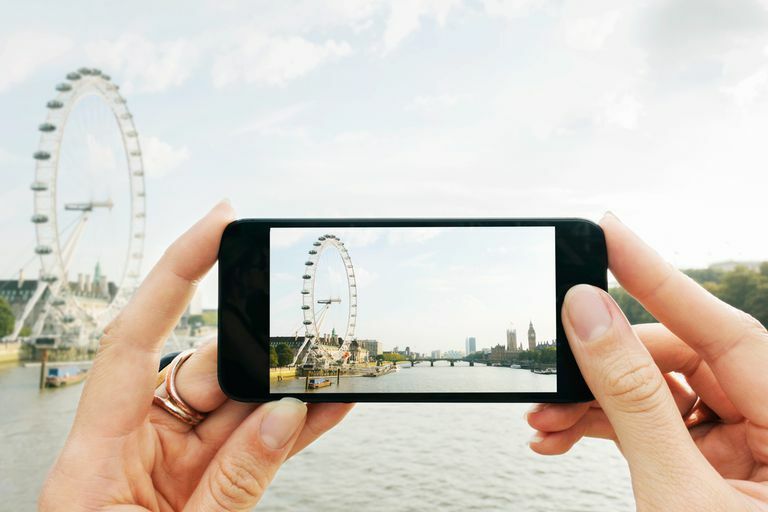 If your phone sees any historic landmarks, Google will give you fast facts and trivia. Google can identify buildings, works of art and sculptures. Google Lens can also be used to copy and paste text in hard to reach areas, like the serial number inside of your refrigerator, which you need whenever you contact service or order parts. You can also use Google search for shopping. Point the Lens to furniture, dresses, shoes, appliances, gadgets, and décor, and Google will not only pull up shopping location and pricing but also reviews for similar items. Google lens is accessible via iOS through your smartphone camera, through the Google Search app, and for the photos already in your photo library. Also, because you are accessing Google services, you will need an internet or Wi-Fi connection before Google Lens can provide answers about your images. To start using Google Lens on your iPhone, download the latest version of the Google Photos app. When you open the Google Photos app for the first time, the app will ask for your permission to give Google Photos permission to access your photos. Tap OK. The Google Photos app will not work until you grant permission to access your photo library. Once permission is granted, all of the photos stored on your iPhone will automatically appear in Google Photos. Open an image, and tap the Google Lens icon, located on the bottom of the screen. Below the image, a description of the item, similar photos, and other information will appear. You can tap on another area of the photo to learn more. Google Lens can also be used with your iPhone camera to scan anything in the real world to give you information about whatever you point your camera at, in real time. To access Google Lens on your iPhone camera, you'll need to download the latest version of the Google App. Open the app and click the Google Lens icon to the right of your search bar, right beside the microphone. Google will ask for permission to access your iPhone camera, so click OK.
Once permission is granted, the Google screen will transform into your camera. As you scan your environment, Google Lens will activate by popping little bubbles across the screen. Tap any of the bubbles to get more information and a Google analysis of what you're looking at. Sometimes Google gets it wrong, as you can see from this photo of a dog out in the snow. Google Lens doesn't recognize the dog, instead focusing on the chair-like item in the upper left corner of the picture. Because of this mistake, Google describes this wintry scene as a white chair, with options to purchase a similar chair. It's good to note that at the bottom of the description, Google asks, "Do you find these descriptions useful?" Checking yes or no helps Google improve results for next time. All of your search history, including Google Lens search results, are stored in your Google account. You can delete your history from your My Activity page.